Today Light Table is taking a huge step forward - every bit of its code is now on Github and along side of that, we're releasing Light Table 0.6.0, which includes all the infrastructure to write and use plugins. The alpha can be installed on Mac, Linux, or Windows. This latest release (0.6.0) includes the plugin infrastructure – capable of fundamentally redefining or adding anything to Light Table. Realistically the only distinction between the core code and a plugin is which things we ship by default. This gives us an enormous opportunity to redefine what development is. 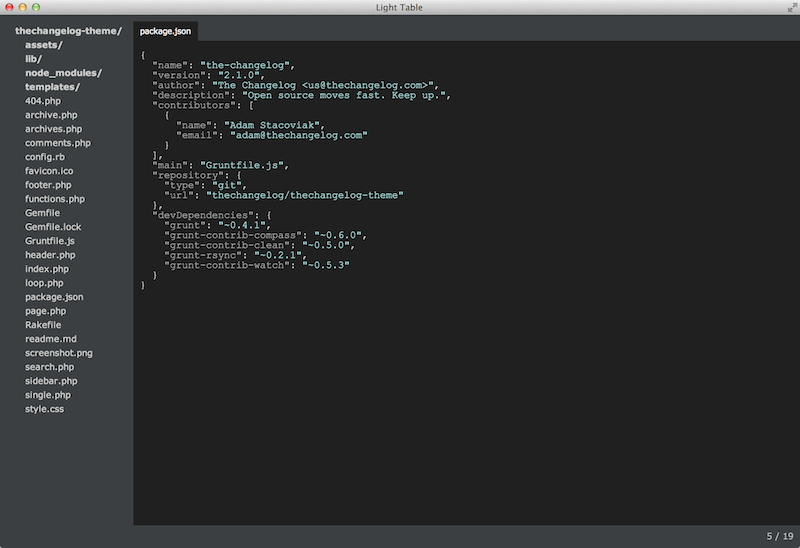 Light Table is written in ClojureScript. Read the full changelog to see all the work since the initial 0.5.0 release. Check out the source on GitHub.